The following Sketch Book entry was drawn in Barcelona, Spain in 2000. Half way in route up the hill to the Gaudi Museum in Barcelona, Spain, we stopped to enjoy a beer and a sandwich Spanish Style, which was “jamon” on bread with a tomato smeared quickly across the bread. We delighted in the hint of tomato and listened to rock and roll as I finished four sketches of Picasso’s work we had seen in a museum housing his early works. Then inspired by Picasso, I drew four of my own pieces. Picasso created prolifically throughout his 92 years, and from his work came rare genius. If you create, and you create volumes, mountains of art, then every once in a while, you create a masterpiece. The point is to wake up and create. Jamon is a type of cured ham usually made in Spain. Next week we’ll be taking a look at Tangier, Morocco. This week we look at Matisse’s Backs, a series of four sculptures designed by the artist which were hosted in the Tate Museum in London at the time of drawing. 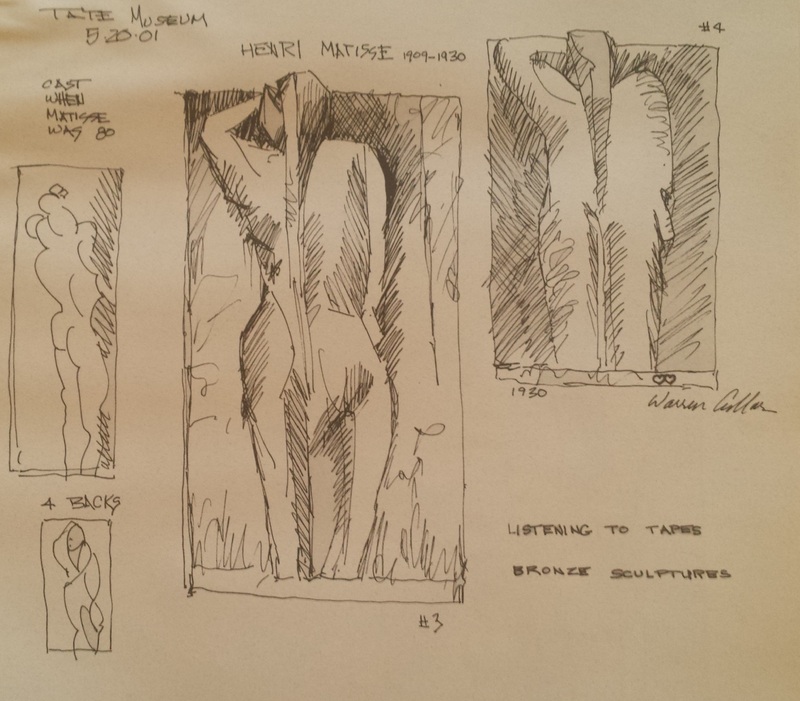 Kitty and I were sitting on a black leather bench in the new Tate Museum in London listening to a tape about Matisse’s bronze sculptures, titled “Four Backs.” It was an awesome experience because I was seeing the majestic backs, drawing them, and listening to an art historian on tape. What a multi-sensory experience! These larger than life bronze sculptures were produced first in plaster and then, 60 years later, cast in bronze. They were cast when Matisse was 80 though he started them back when he was very young. Each back is a little more abstract as he goes into his later years. As his mind matured, so did his art. Several days later, we were in England at Stonehenge. My mind superimposed Matisse’s “Four Backs” onto the massive strong pieces of the huge monoliths. My own work in bronze is definitely inspired by these bronze relief sculptures. This is what art is all about: seeing things as they are, but interpreting them in a different way. Created from left to right in: 1909, 1913, 1916, 1931. Matisse was a contemporary of Pablo Picasso and another great artist of the time. He was born in 1869 as the eldest son of a prosperous grain merchant. Unsurprisingly, his father was not happy when Matisse decided to pursue a career as an artist. Personally, I am fascinated by Matisse’s relationship during the world wars. He himself was largely apolitical and avoided controversy, but both his son and daughter fought in the French Resistance, his daughter even being captured and tortured by the Gestapo before escaping. Several of his students were also involved in the war or ended up as casualties during it. I can hardly imagine the hardship he must have gone through seeing friends and family risk their lives. German and Russian forces were not kind to any artwork they came across, and I suspect that Matisse’s silence was partially a result of trying to protect everything he created. 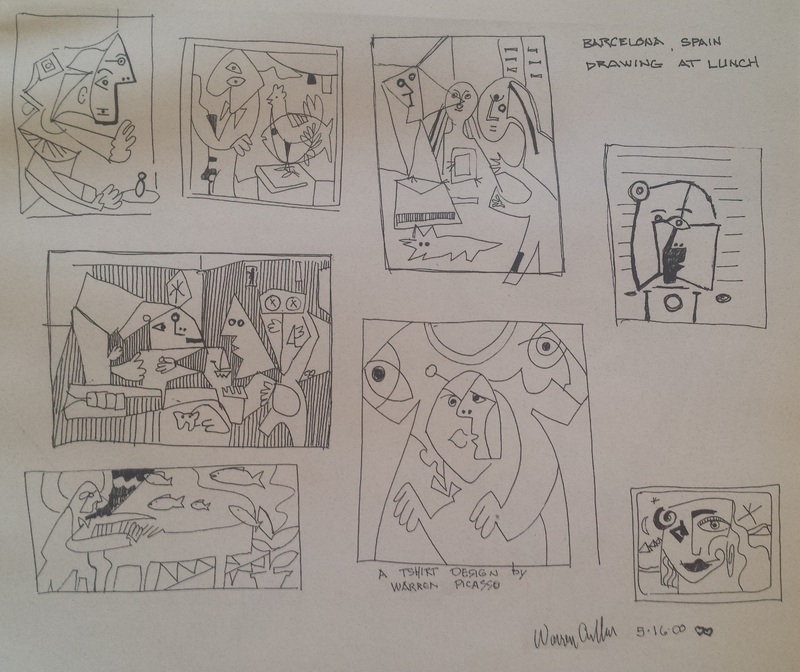 Next week we’ll be looking at some of Warren’s own drawings, inspired by Picasso’s own works.